Kitchen exhaust fans may be mounted flush on a wall or over a kitchen island. Kitchen exhaust fans are a vital addition to your kitchen remodeling project. The right exhaust fan can clear smells and smoke from the kitchen quickly and easily, as well as improve the look of your kitchen. No matter where your stove is located in your kitchen, or how your home is laid out, there's an exhaust fan perfect for your home. Most ranges come with a basic kitchen exhaust fan, but these fans simply pull the smoke or steam from the level of the stovetop and recirculate it through vents at head level. That means the smoke and smelly air isn't really removed from the kitchen, it's just moved up. You'll be able to see what you are doing better when you use one of these fans, but it doesn't really help the problem of getting rid of smelly or smoky air. Some kitchen fans actually vent into the attic space; this is a really bad idea. If you have a fire on the stove, the ductwork will actually pull the fire into your attic, causing a much bigger fire. If your ductwork is greasy, as it often is when you're dealing with the kitchen cooktop, you'll have a grease fire on your hands instead of just a basic stove fire. More commercial-grade exhaust fans are now available for home kitchen use. These fans are much quieter than the conventional home-grade models and are also more efficient at pulling smoky, stinky air out of the room. They should be vented to the outside of your house for safety and to do their job of clearing the air. Another option is to buy a house-wide exhaust system, which works sort of like the central vacuum cleaner. There is one motorized fan for the whole house, and when you turn it on, the air from each room with a suction duct is sucked out. This is great if you do a lot of frying, but for most people this is more exhaust (and more money) than they really need. Kitchen exhaust fans come in different sizes, with greater or lesser ability to circulate the air. Assuming you are using your exhaust fan with a range hood, all you need to know before you go shopping for your exhaust fan is the BTU (British Thermal Units) rating of your range. For every 10,000 BTUs produced by your range, your exhaust fan should have a CFM rating of 100. CFM stands for cubic feet per minute and is a measure of how much air the fan can circulate. So if your range measures 50,000 BTUs, get a fan that is rated for at least 500 CFM. 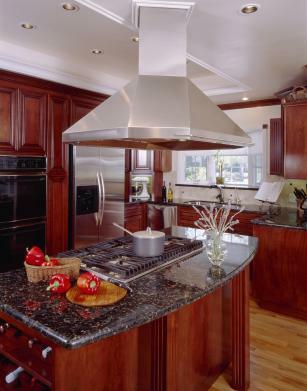 Many range hoods have the exhaust fan built into the hood, as with the Vent-A-Hood models. This company makes a wide range of hoods and exhaust fans to mount under a cabinet, on the wall or over a kitchen island. Range hoods are now available that perfectly match the rest of your kitchen décor, whether you're going for a modern, all-stainless steel look or a rustic country kitchen. Range hoods may also have lights built in that can help you see what you are doing on the range (this is an option mostly on the under-cabinet and wall-mounted styles). You can even get an exhaust fan and range hood for your covered outdoor kitchen to make your outdoor cooking experience even more enjoyable and to route cooking smoke away from your guests. Home improvement stores and catalogs have a wide range of options available when it comes to kitchen exhaust fans and range hoods. You can always special order something if you don't see the perfect model for your home on the shelves. As you'll notice, it is possible to get a completely customized range hood built exactly to your specifications, including the materials you want to match the rest of your kitchen. While most people don't have the budget for that, it is still possible to find lovely kitchen exhaust fans and range hoods in many different styles to fit a range of budgets.